I was surprised (although I don't know why) but without thinking I smiled and 'ok, lets do it then' Aaron thought we were mad and I'm sure many people would agree with him, (especially my friend Sam who is such a wimp she won't get in a pool by the end of September!) but I figured if hundreds of mad people survive a swim in the Channel at this time of year then in 22 degree sunshine it shouldn't be too bad. It's been an interesting year, it started with Aaron at home looking for work, then had him working 7 days a week for the whole summer whilst I got increasingly large and waddled around waiting to give birth. Leo started school, and in August we welcomed Loukas and our little family became complete. I decided to look back over the year with my favourite blog post and one photo from each month. In February I had got used to the idea of a new baby and I was really happy to have found a doula. In March I shared the story of my Mum's little travelling companion and introduced Travel ted to the world! In April, we found out that our new addition was going to be another boy and I wrote about how it felt we were entering a new chapter in our life. As the line from the best Christmas song ever goes.... the bells here were certainly ringing out for Christmas day, at about 6am at the big church just down the road. 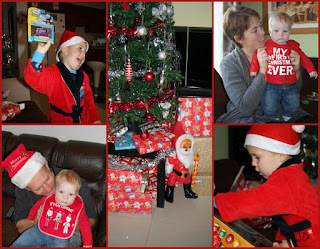 We had a lovely Christmas day at home (well here and my Mum & Dads but it's the same difference - it's only downstairs!) Louka was first awake but we still got a lie in as Leo didn't wake up till gone 7am, despite the church bells. Leo called me into his bedroom and I went and sat on his bed, he asked if it was time to get up but made no mention of presents. He was so excited he didn't even realise there were some more under the tree! 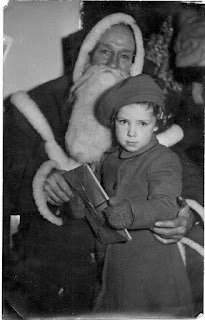 This week for Flashback Friday I'm handing you over to my Mum, as she shares her Childhood Christmas memories. As a child on Christmas morning, my presents would always be at the bottom of my bed in a pillowcase. If I woke up during the night, I would chose one of the presents to open and snuggle down in bed again till the morning, although I wanted to open them all, I would have hated to have nothing to open when I got up. I always had a selection box, normally books or games from my Aunts and Uncles, things that could be made or drawn and usually something doll related. My Dad was always the last to open his presents and did so with the use of his penknife. In memory of those days every Christmas Dad’s penknife is still put on the unit and if it is used we always thank him. It's not often it can be said but tonight our little Leo was an angel! 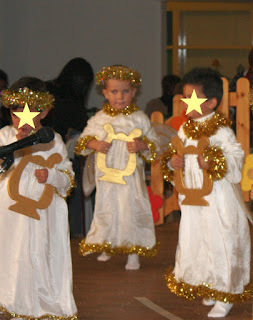 He played his part in his first ever school play and was brilliant! I had no idea if he would take follow in my footsteps and refuse to do it and burst into tears or if he would do what he was supposed to. He had learnt his lines off by heart, even correcting me on my pronunciation of them, and had been excitedly showing me how he had to run around on the stage but I didn't know if the huge audience and camera flashes would put him off. Unfortunately we were sat the other side of the stage to where he stood but we did see him and also manage to get a great photo. It was the only photo we got of him as he refused to let Aaron take one before we left home. Not wanting to upset him before the play we didn't force the issue! Until I met Aaron that is and we realised that we both dislike Christmas Cake and pudding, along with his brother and sister. 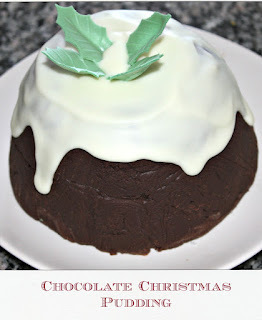 He then introduced me to his Mum's alternative Christmas pudding she has made for years now, which I promptly adopted and have used every year since. 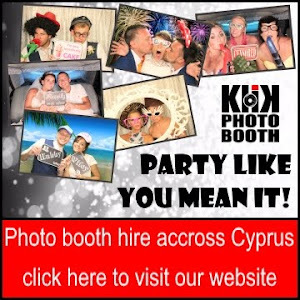 It's often said by expats here in Cyprus that Christmas doesn't feel like Christmas, there's several reasons for this, blue skies being one of them but also not being surrounded by family and friends, not seeing Christmas adverts and programs on the TV and the fact that it is not so 'in your face' as in the UK. The first couple of years we were here we struggled to find things to do with a Christmas theme, friends of mine who have been here for years say that only 6 or so years ago there was nothing at all. 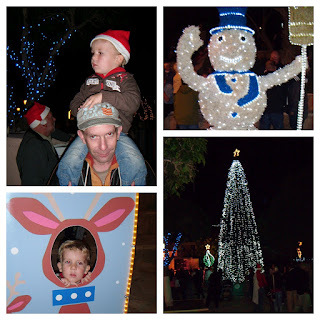 It seems to be changing though, Agia Napa has several events including the switching on of the lights and a visit from Santa and this year there seems to have been a lot more Christmas fairs and such like. 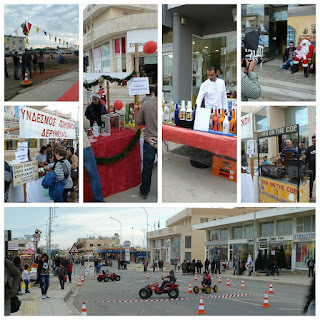 Last weekend I was really looking forward to the 'Deryneia Christmas Avenue' event held in our village. Last year was the first year that Leo got excited about Christmas, admittedly he still didn't know exactly what was going on but he certainly got the excitement. 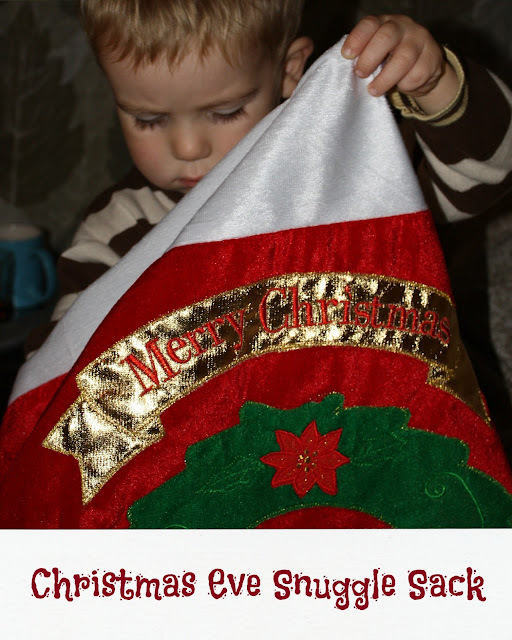 I've always loved Christmas and have looked forward to having our own family Christmasses for a long time so I was really excited about developing our own traditions that the boys will grow up with. So last Christmas I made the first 'Snuggle Sack' created after seeing this post over on Thinly Spread. The idea of the snuggle sack is for it to be a family event unlike the stockings the boys will have one each of the following morning. What is happening next month? Mardi, (Aaron's Mum) Tomas and James are coming to Cyprus. It's Christmas next month, What does Christmas mean? What do we see at Christmas? Do you know what happens at Christmas time? We put a tree up and put lights on it. 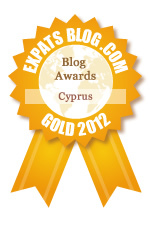 It was our three year anniversary of moving to Cyprus on 24th November. Many people have said they can't believe its been that long and although in some ways it seems hard to believe I feel like we've been here forever. It feels like a lifetime ago that we lived in the UK. My parents have UK tv channels and it seems 'foreign' to me to see adverts in English or watch the local Kent or London news. I'm vaguely interested at times but it just doesn't feel relevant to me any more. It may seem a long time ago but I remember our first couple of days so clearly. Our shipping was due to arrive about a week after we did so we had huge problems in packing our final suitcases. Although our apartment came furnished we had nothing except the basics and we also needed a cot, steriliser and various other baby paraphernalia. Saturday was the Christmas lights switch on in Agia Napa, a great free event which takes place each year in the town square. It's always very busy with locals and tourists alike and to get involved you do have to repress the extremely British urge to queue! Santa arrives in a horse drawn carriage and gives out free presents to anyone who can brave the scrum - luckily my Mum seems to have adapted to the surroundings and can wiggle her way to the front of crowds quite well now! 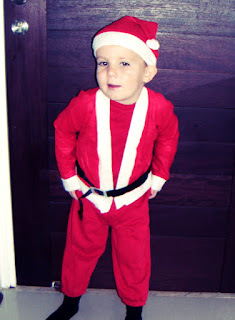 I have declared that this weekend will be 'Decorating Day' in our household, this is purely my decision as Aaron was over ruled for the last time last Christmas when he tried one last time to get me to put them up on Christmas Eve. Instead this year we have been having a debate about swapping Christmas trees with my parents, we have a Christmas tree brought years ago before we left England from Notcutts Garden Centre which has been nicknamed 'the biggest Christmas tree in the world', it's a great tree but unfortunately we don't have the biggest apartment in the world to match! For the last few years we've just put half of it up (so it sat flat against the wall) but now we've gained an extra child and a whole load of associated stuff, our small apartment seems to have shrunk even more! The solution seems to be to temporary swap as I love our tree and can't bear to sell it!